Lighting-Gallery-net - Miscelaneous Lamp related stuff/"Conform-Lock" type E40 Lamp Base/Cap. "Conform-Lock" type E40 Lamp Base/Cap. This composite picture shows an E40 Base/Cap fitted to a Generic Chinese Sc-Na Metal Halide Lamp (MH-400) by the "Conform-Lock" technique. This technique was developed to omit the cementing step in the process of applying bases to bulbs and to make for a more reliable fastening so lamps can be removed more easily at End-Of-Life without the chances of capping cement failing due to the torque applied to get the lamp out of the socket. This technique also gets around the "Crimp-Shell" base fastening technique, a Patented technique developed by G.E. So, effectively the neck of the lamp conforms to the inside surface shape of the base and the blob of lead in the dimple locks it in place, hence the name, "Conform-Lock". This is the easiest type of base to remove and replace. Are they E26 caps, Robert...I'm yet to see a small cap use this technique. I think only Thorn used the screw-thread neck mould on E27 lamps, possibly also Sylvania on some small American HID lamps. Many lampmakers introduced this during the 1970s, but by the 1990s dropped it again due to unreliability. It was a pity because this was an easy and fast method of capping lamps, but it holds the cap much too rigidly to the glass and is prone to causing ring-offs during lamp life. It also became increasingly difficult to control when lead-containing solders had to be phased out. So most of the best manufacturers have reverted to cemented bases now. Would it be possible to go back to screw thread bases if the glass is made stronger? The "new" RoHS (Restriction of Hazardous Substances)compliant solders (Certainly in the E.U., not sure about the United States or Canada) are effectively nearly pure tin with about 5% of various other metals like silver, copper, antimony etc. added to prevent it turning into alpha tin and crumbling away. Pure tin only has a melting point of 232*C, (450*F). Addition of small amounts of other metals will change this, but if the additions are less than 5% by mass, the change won't be much. Pure lead on the other hand had a melting point of 327*C, (621*F). It is often alloyed with a small amount of antimony which makes it harder but does not alter the melting point much. 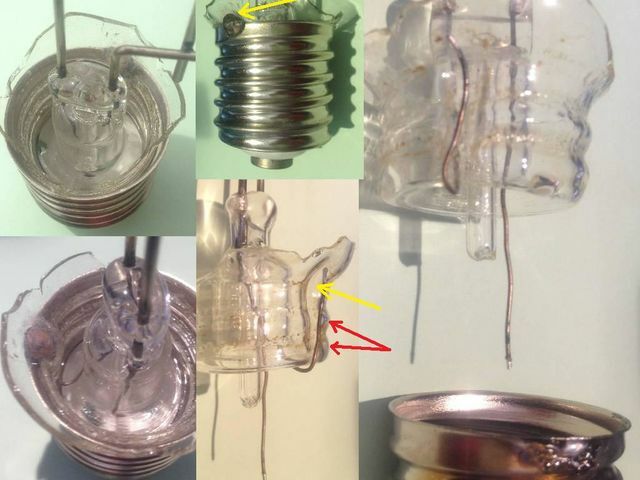 In this base type, the blob of metal that locks the cap in place and acts as the electrical attachment of the lead-in wire looks like lead and behaves like lead when melted, thus I assume it is either pure lead, (by the way the side cutters cut through it) or an alloy with very high lead content and a melting point near to that of lure lead.....which is generally high enough to withstand the cap/base temperatures of most lamps which generally don't exceed 250*C, (482*F). The new tin based solders possess melting points closer to that of pure tin, the melting point of which is generally less than or near to the cap up temperatures of many traditional lamps. So the strength of the glass is not an issue. It is sort of like saying that the Government has decreed that you MUST use hexagonal wheels on your car, so will changing the engine from a petrol, (gasoline) one to a Diesel one remove the issue of the, now bumpier ride? One interesting side point to note here....the new RoHS solders...now used in all manner of consumer electronics, are harder and more crystalline/brittle than the traditional eutectic 60/40 Pb/Sn solder, (which stoicimetrically works out to be "Lead-IV Stannide") which had a malleability somewhat between that of pure lead and pure tin. The tendency for tin to alter itself to its non-metallic alpha form is still prevalent despite the additions of small quantities of other metals. There are many "lead-free" these days solders but all contain at least 85% tin and the great proliferation of them seems to be as a result of manufacturers desperately trying to get around the alpha tin issue and a more reliable substance that won't crumble away like pure tin does...but also avoid infringing upon each other's patents. While this is happening one gets the sense that the problem initially created by Government Decree has not really been solved. These days we seem to be "re-creating" problems that our ancestors had already solved. 60/40 solder was a mature technology, it had been tested to the "n-th degree" in both the lab and in the field and its long term statistical properties were well known and understood. But this new stuff has not attained that state yet ans we are part of the "testing" process everytime a piece of consumer electronics in our possession fails. As a consequence, consumer electronic equipment is now far more prone to "dry" joints, fractured solder joints, often due to masgnetostriction and often found under P.C.B. mounted transformers, (which are heavy and vibrate) leading to lots of failure issues....HOWEVER, non-consumer electronics, D-Slams, Backhaul links, Servers, Transmitters and the like are exempt from the new RoHS decrees as the mean time between failures was deemed unacceptable in these more "important" applications if RoHS compliant solder was used...so they were exempt and still use traditional 60/40 solder of known and definable characteristics, particularly over time. RoHS must not apply in the US, because many parts for my little bulb project say they aren't compliant. It could be that failure rate that allows them to be sold, or that nothing else is available. There is an exemption for use of lead in solders for lamp caps where it is needed on the grounds of high temperature capability. Nevertheless most of the big manufacturers abandoned screw-thread moulded glass anyway due to its technical inferiority. However the RoHS rule kind of backfired due to the loophole on thermal capability, because in practice only the manufacturer knows whether or not he requires this - and many companies that were previously using e.g. 60/40 alloy on their lamps just changed to using >85% lead alloy as the easy option to make them RoHS compliant and claimed it was needed for thermal reasons. It has often been contested that lead usage actually increased rather than decreased as a result of the RoHS legislation! Just like how lead-containing glasses had to be phased out - only to be replaced by something similarly undesirable, in the way of the modern Barium glasses used for lamps. You know, James....it's little bureaucrats in offices....never been out into the World and solved any REAL problems. These "toxic" elements, Mercury, Lead, Arsenic etc., THEY came from the Planet, they are still on the Planet and they always will be on the Planet no little "bum on a seat in an office" will make any difference to that. There are places in New Zealand, I think it is along the Tanewera Rift Zone where the two tectonic plates grind against/past each other, hydrothermal action, ground water percolating down to the magma...which ain't that far down near Rotorua...where it gets really hot...way hotter than boiling at atmospheric pressure and thus able to dissolve all sorts of things we see as insoluble with tiny Ksp's, (like PbS and HgS to name two) dissolve really well at 950*C in red-hot water! This brings all sorts of stuff up to the surface, ether during eruptions or just slowly, all the time through fissures or fumaroles, and mercury vapor is one of them. I have heard of a pub in NZ, somewhere in this area, with all the zinc washed off the corrugated galvinized iron roof by mercury! Mercury metal drips from the spouting pipes! So there you have it...let the the RoHS niconpoops deal with that issue....like King Canute telling the tide to go out! And what about every other volcanically active area on this Planet? So, really, when looked at in the broadest sense it is just childish control and "Mollycodelling" of the population, treating us like children even after we have matured and become adults. It does "solve" one issue though. when humans do irresponsible things with these elements...most often due to ignorance and greed....like dumping loads of electronics in poor countries and contaminating otherwise "clean" environments, that the people there then must endure. If you have no money and no respect from others, no amount of Government decrees will protect you and nobody will care either!